Yesterday was my Mom’s birthday. And about two weeks ago she gave me a not to subtle hint that I should be knitting her something (thanks, Mom). The last time I asked her what she might want me to make for her next she told me a big wrap. So I went on a search for wrap patterns that would be easy for me to do in about two weeks and I wouldn’t really need to reference the pattern. I settled on Stephen West’s Smooth Move Shawl. 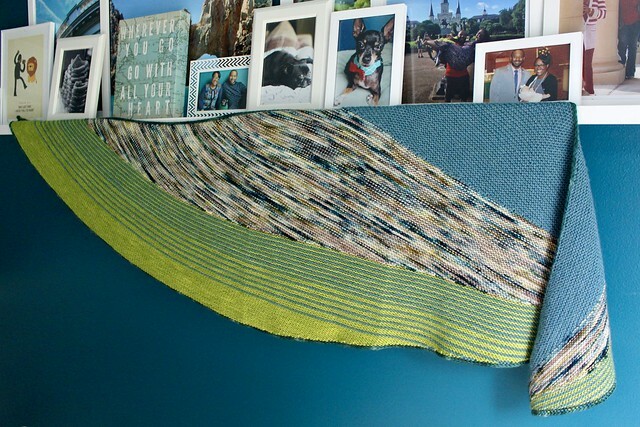 Endless garter stitch with an easy to remember wrap and turn. I used Berroco Vintage DK in Breezeway (the lighter teal), Miss Babs Yowza in Surprise (the variegated color in the middle) and then did stripes with the Berroco Vintage Breezeway and Miss Babs Yowza in Ghoulish, a color I used for a project for my mom before and some leftover Neighborhood Fiber Co. in Rock Creek Part for the i-cord edge. I thought it was a fun mix and my mom likes blues and greens, so I touched on all her colors in one big wrap. 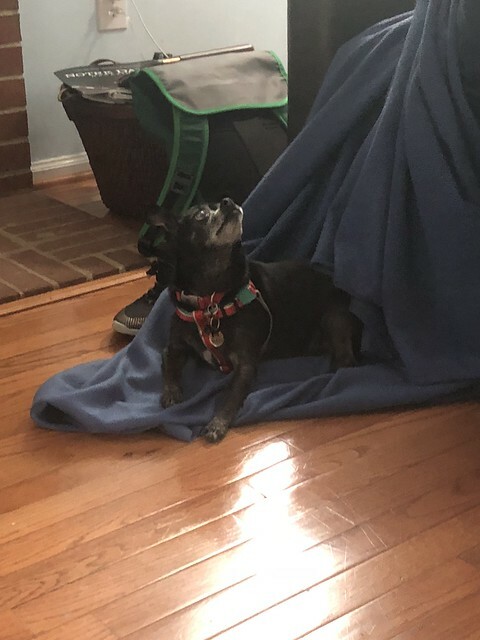 It’s an extra long snuggy I sewed for my Dad years ago and the fabric pools around her feet so Cher decided it was the perfect amount for them to share the blanket together yesterday. Now on to finishing my test knit and my Rainbow Tecumseh! the colors blended very nicely! it is lovely! What an absolutely lovely gift for your Mom!!! Gorgeous! I love Stephen West patterns; his directions are impeccable. The ones I have done are all fun to do and give a gorgeous finished product. 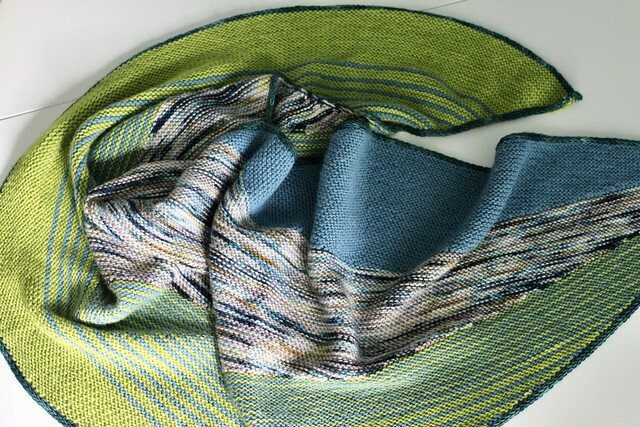 Love the way variegations and solids work together in this piece. Your examples always get me interested in patterns I might not have considered before. West patterns delight me when I see them, but I’ve assumed they would be too huge for a short body. Your description of mods you’ve made is so helpful! And your mom is one lucky lady. Many happy returns to her!